This crunchy delicious treat is perfect for coffee and chocolate lovers. 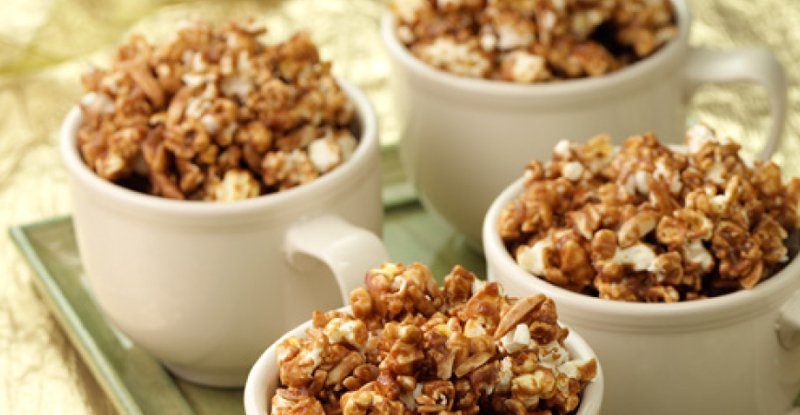 Almonds and popcorn are coated with a coffee and Swiss Miss® Cocoa combination for a mocha flavour. Spray 13×9-inch baking pan with cooking spray. Place popped corn and almonds in pan. Combine cocoa mix, coffee crystals and hot water in medium saucepan; stir until crystals are dissolved. Add sugar, margarine, corn syrup and salt; place over medium-high heat. Bring to a boil; boil 2 minutes, stirring constantly with wooden spoon. Remove from heat; stir in baking soda. Immediately pour over popcorn mixture and toss gently to coat evenly. Bake 15 minutes, stirring every 5 minutes. Remove from oven; stir again. Spread on waxed paper to cool thoroughly.